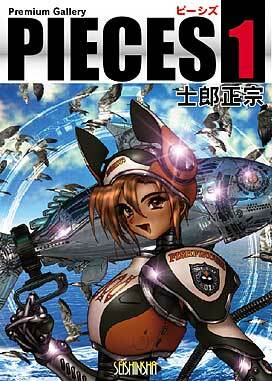 Information of Shirow Masamune's Premium Gallery "PIECES 1"
Including many illustrations not released before and color variatiions not shown in INTRON DEPOT. Premium Gallery collecting three full color comics EXON DEPOT not collected ever is to be published at end January, 2009! Sorry, this calendar is sold only in Japan. 15.APR.2018 Data Liblary was updated. The next update is scheduled at 14.MAY.2019. 13.MAR.2019 Data Liblary was updated. The next update is scheduled at 09.APR.2019. 15.FEB.2018 Data Liblary was updated. The next update is scheduled at 12.MAR.2019. 15.JAN.2019 Data Liblary was updated. The next update is scheduled at 12.FEB.2019. 12.DEC.2018 Data Liblary was updated. The next update is scheduled at 15.JAN.2019. 13.NOV.2018 Data Liblary was updated. The next update is scheduled at 11.DEC.2018. 10.OCT.2018 Data Liblary was updated. The next update is scheduled at 13.NOV.2018. 11.SEP.2018 Data Liblary was updated. The next update is scheduled at 10.OCT.2018. 17.AUG.2018 Data Liblary was updated. The next update is scheduled at 11.SEP.2018. 10.JUL.2018 Data Liblary was updated. The next update is scheduled at 14.AUG.2018. 12.JUN.2018 Data Liblary was updated. The next update is scheduled at 10.JUL.2018. 08.MAY.2018 Data Liblary was updated. The next update is scheduled at 12.JUN.2018. 15.FEB.2018 Data Liblary was updated. The next update is scheduled at 08.MAY.2018. 15.MAR.2018 Data Liblary was updated. The next update is scheduled at 10.APR.2018. 15.FEB.2018 Data Liblary was updated. The next update is scheduled at 13.MAR.2018. 09.JAN.2018 Data Liblary was updated. The next update is scheduled at 12.FEB.2018. 12.DEC.2017 Data Liblary was updated. The next update is scheduled at 09.JAN.2018. 14.NOV.2017 Data Liblary was updated. The next update is scheduled at 12.DEC.2017. 21.SEP.2017 8 items were added to the SEISHINSHA BOOK DATABASE. 486 items are registered. 12.SEP.2017 Data Liblary was updated. The next update is scheduled at 10.OCT.2017. 09.AUG.2017 Data Liblary was updated. The next update is scheduled at 12.SEP.2017. 13.JUN.2017 Data Liblary was updated. The next update is scheduled at 08.AUG.2017. 13.JUN.2017 Data Liblary was updated. The next update is scheduled at 11.JUL.2017. 09.MAY.2017 Data Liblary was updated. The next update is scheduled at 13.JUN.2017. 11.APR.2017 Data Liblary was updated. The next update is scheduled at 09.MAY.2017. 14.MAR.2017 Data Liblary was updated. The next update is scheduled at 11.APR.2017. 14.FEB.2017 Data Liblary was updated. The next update is scheduled at 14.MAR.2017. 11.JAN.2017 Data Liblary was updated. The next update is scheduled at 14.FEB.2017. 13.JUL.2012 12 items were added to the SEISHINSHA BOOK DATABASE. 478 items are registered. 11.JAN.2001 the English pages was opened temporarily.